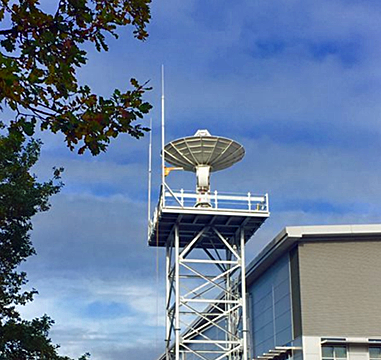 Surrey Satellite Technology Ltd (SSTL) and Viasat (NASDAQ: VSAT) have now marked the start of operations with a ribbon cutting ceremony for the new Viasat antenna system that has been installed at SSTL’s Guildford headquarters. The Viasat RTE antenna at SSTL, Guildford, UK. Photo is courtesy of SSTL and Kathryn Graham. The new antenna system forms part of the Viasat Real-Time Earth (RTE) network, a hybrid ground and space network, which has been designed to provide low-latency satellite data to users on-demand without the need to invest in a dedicated antenna system. Through this relationship, SSTL can now offer satellites with a full range of ground services to their customers, enabling quick delivery of data to customers’ processing centers on a subscription basis. The Viasat RTE antenna at SSTL, Guildford, UK. Photo is courtesy of SSTL and Emily Kelly. The antenna system installed at SSTL is a full-motion, 5.4 meter system that can operate in both S- and X-bands and is fully controlled from the Viasat Network Operation Center in Colorado. The Guildford site joins other sites in the United States, Argentina, Australia and Sweden as part of Viasat’s roll out of the RTE network. The new antenna system was installed in November of 2017 and has been successfully used to command and control SSTL satellites, thus fully testing out the network architecture. Seamless routing from the SSTL Satellite Operations Center in Guildford through the RTE network to the satellites has been achieved and final testing is now underway, with expected completion by the close of January 2018. SSTL’s payload data share customers, such as those signed up for the NovaSAR mission, will benefit from easy access to payload data via the option of a bundled payload and network access contract. In addition to the RTE network, SSTL’s ground infrastructure includes two ground stations in the UK and a ground station mini rack at Kongsberg Satellite Services facilities in Svalbard. 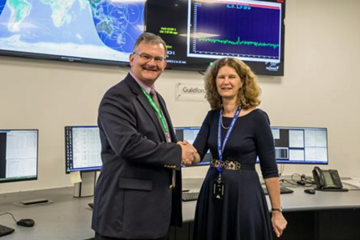 Photo of Kent Leka, GM of Viasat Antenna Systems, and Sarah Parker, MD of SSTL. Photo is courtesy of SSTL and Kathryn Graham. Kent Leka, general manager, Antenna Systems, Viasat, said that Viasat and SSTL worked closely together on the integration of SSTL specific uplink and downlink protocols into the RTE ground station equipment to achieve “plug-n-play” compatibility between the satellites and SSTL’s Satellite Operations Center (SOC). SSTL’s satellites will now be able to use any of the ground stations within Viasat’s RTE network seamlessly, with no hardware changes needed. James Northam, Head of Satellite Operations, Ground Segments and Mission Services at SSTL, added that the ability to use the Viasat RTE network with plug-n-play compatibility to SSTL’s protocols opens a new range of options for the firm's customers who now have the option to use the RTE network to download data from their satellites without the need to invest in a ground station infrastructure of their own. 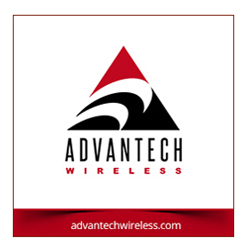 Customers have the choice to invest in their own ground segment infrastructure, use the RTE network, or even a combination of the two. The addition of RTE will brings substantial flexibility to SSTL Mission offerings.